VICTORIA — Documents that say money laundering in British Columbia now reaches into the billions of dollars are startling to the province's attorney general who says the figures have finally drawn the attention of the federal government. 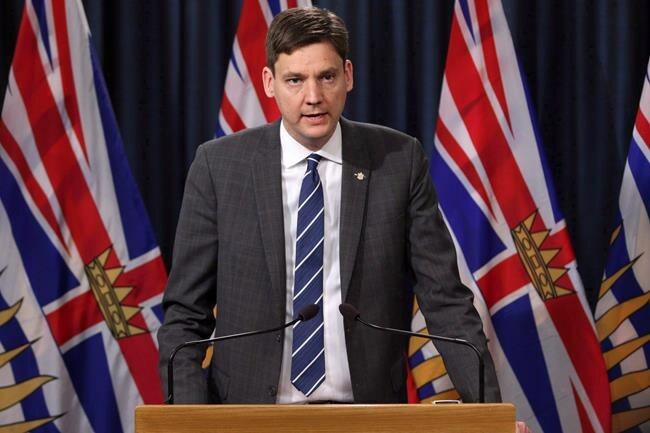 David Eby said he's shocked and frustrated because the higher dollar estimates appear to have been known by the federal government and the RCMP, but weren't provided to the B.C. government. He said he recently spoke to Public Safety Minister Ralph Goodale about information gaps concerning cash being laundered in B.C. and he'll be meeting next week with Minister of Organized Crime Reduction Bill Blair. "I've been startled initially by the lack of response nationally to what appeared to me to be a very profound issue in B.C. that was of national concern," said Eby in an interview. Eby said that number now appears low, especially after the release of an international report that pegs money laundering in B.C. at more than $1 billion annually, although a time period wasn't mentioned in the report. A second report by the RCMP estimates $1 billion worth of property transactions in Vancouver were tied to the proceeds of crime, the attorney general said. The provincial government only learned about the reports through media leaks or their public release and it wasn't consulted about the reports, Eby said. "The question I ask myself is why am I reading about this in an international report instead of receiving the information government to government," he said. "It's those information gaps that organized crime thrives in and we need to do a better job between our governments." "It is estimated that they laundered over $1 billion (Canadian) per year through an underground banking network, involving legal and illegal casinos, money value transfer services and asset procurement," stated the report. "One portion of the money laundering network's illegal activities was the use of drug money, illegal gambling money and money derived from extortion to supply cash to Chinese gamblers in Canada." "Some of these funds were used for real estate purchases," the report stated. "Surveillance identified links to 40 different organizations, including organized groups in Asia that dealt with cocaine, heroin and methamphetamine." Eby said the G7 task force report included information the province didn't have about money laundering in B.C. from the federal government via the RCMP. He said the B.C. government also confirmed the RCMP compiled an intelligence report about proceeds of crime connections to luxury real estate property sales in Vancouver, but his ministry doesn't have the report. "We still don't have a copy of it," Eby said. "We are taking action to combat this by enhancing the RCMP's investigative and intelligence capabilities both in Canada and abroad, and our Financial Intelligence Unit further helps protect Canadians and our financial system," said the statement. German's report to the provincial government last June concluded B.C. 's gaming industry was not prepared for the onslaught of illegal cash at the casinos and estimated more than $100 million was funnelled through the casinos. "We're having some difficulty getting the information we need for Dr. German to make a true assessment of the extent of the problem facing B.C.," said Eby. "We do realize there is a lot of anecdotal evidence on the extent of money laundering in real estate, but we really don't have a good handle on that," said Maloney. "We're looking at whether or not we can produce some good evidence of that. We're looking at do we have that data available in B.C. or indeed Canada." Documents dated August 2016, show the government's Gaming Policy Enforcement Branch observed so-called "high roller" patrons at a Metro Vancouver casino for a year starting in January 2015 and concluded people connected to real estate were the top buy-in gamblers at $53.1 million. A spokesman for B.C. 's gaming industry said reports from the gaming operators about cash transactions flagged concerns of money laundering. "This had the effect of reducing the value of suspicious transactions by more than 60 per cent over the next two years," he said. "More recently, operators implemented Dr. Peter German's interim recommendation requiring additional scrutiny of large cash buy-ins in January 2018 and this has further driven down the number of suspicious transactions."